It is easy to spot the trappings of dejection along the now broken Singur roads, after the Calcutta High Court division bench judgment termed the Singur Act, a legislation introduced by the Mamata Banerjee government to recover some land leased to Tata Motors Ltd, as "void and unconstitutional". "I have lost everything in this battle. Mamata Banerjee became the chief minister because of us, and we got nothing," said Gopal Kayal, a 67-year-old farmer, who lost seven bighas of land. 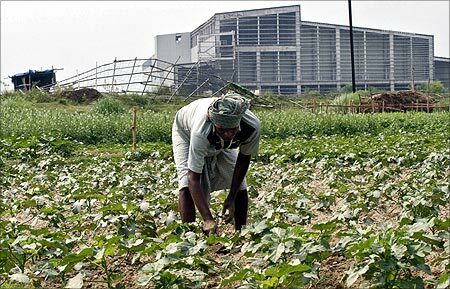 Image: A farmer works a crop next to the closed Tata Motors Nano car factory in Singur, north of Kolkata. 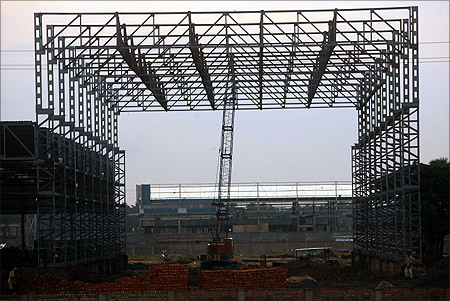 The land at Singur, which the Singur Land Rehabilitation and Development Act, 2011, sought to reclaim, was one of Banerjee's first major move after she became chief minister last year, empowering her government to take back 400 acres from Tata Motors for the Nano small car project. A number of farmers had not accepted the compensation for their land at Singur. 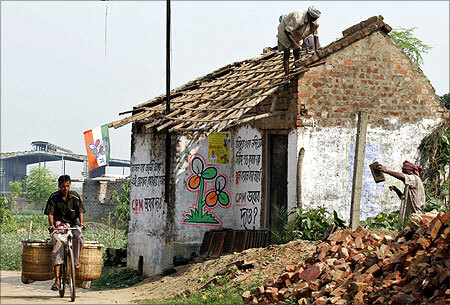 The Trinamool Congress chief had promised to return their land to them. Image: A private security guard walks outside the closed Tata Motors Nano car factory in Singur, north of Kolkata. Kayal is one of the many farmers in Singur who are finally willing to bid goodbye to their lands. "I would have sold my land to (Ratan) Tata had the violence not happened. I will still sell it to him, if only I get the right price," Kayal said. At best, the unwilling farmers are entitled to the compensation at rates on offer six years back. According to the Land Acquisition Act, 1894, "Land once acquired for a public purpose cannot be returned to its original owners". Image: man rides his bicycle as farmers repair the roof of a house near a closed Tata Motors Nano car factory in Singur. "We have now been reduced to begging for rice from the state government. But the 2 kg rice they send us is not enough to sustain families of five people," said Champa Das, wife of a farmer who lost his land. Champa Das added Chief Minister Banerjee had chosen to completely ignore Singur since she reached Writers' Building. "She has reached the top, she can no longer see us as the people she has left behind at the bottom." 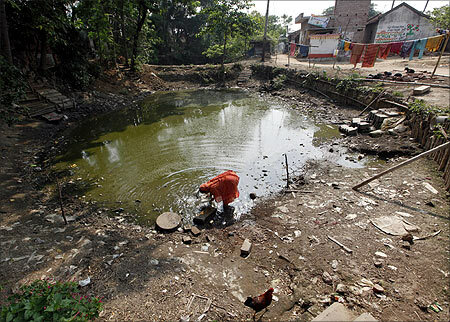 Image: A woman washes her utensils in a polluted pond at Singur, north of Kolkata. A sharecropper who now has no work, and no rights to compensation, said: "None of us now have the money to repair broken houses. The monsoon is upon us, and we are fast coming close to losing even the roof from above our heads." Not everybody, however, shares Champa Das' views on Banerjee. "She has always been with us. She has now made provisions to ensure we do not go hungry and the movement goes on," said Mahadev Das, a farmer and a local Trinamool Congress leader. 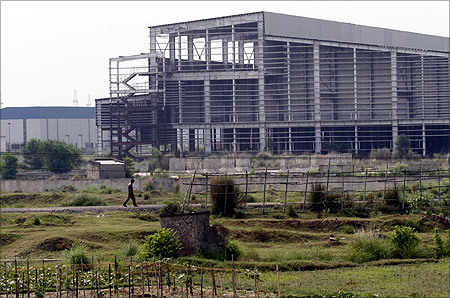 Image: The factory of India's top vehicle maker, Tata Motors' new small car project is seen in Singur. The state government has decided to give Rs 1,000 per month to every son and daughter of a registered land loser. Also, the family of unwilling farmers will get eight kg of rice at Rs 2 per month. However, even on paper, the scheme will be implemented in July. For now, the farmers in Singur, along with their families, are reliant on work being given under the National Rural Employment Guarantee Scheme (NREGS). 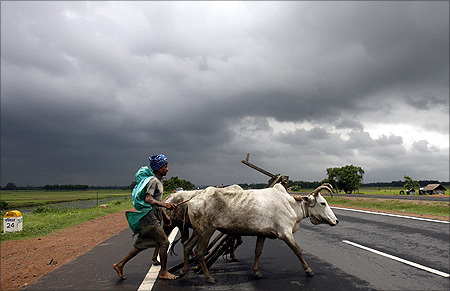 Image: A farmer and his bullocks cross a highway against the backdrop of monsoon clouds in Singur, about 50 km (31 miles) northwest of the eastern Indian city of Kolkata. Apparently recognising the importance of NREGS work, the government has pro-actively been implementing the scheme. According to central government data, of the 9,050 households that demanded work in Singur, 9,044 were provided employment till June 2012. "Yes, it is work and some money. But it is physically exhausting labour, which many women cannot undertake. Also, we are being paid just Rs 120 a day, where we should be paid Rs 136. Moreover, the money is often not given on time," said another woman. 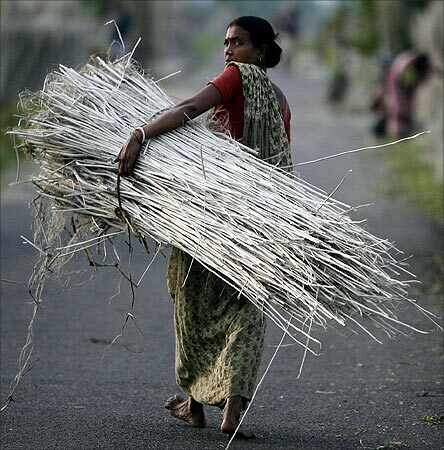 Image: A farmer carries a bundle of jute in Singur.